30 years ago today, Space Shuttle Columbia lifted off the launch pad at Kennedy Space Center for the very first time. In a flight that lasted 54 hours, NASA proved an amazing piece of technology. For 30 years, the best workforce in the world has launched 133 Shuttle flights, dedicated to making each better than the last. I want to thank each and every person who has ever been part of the shuttle workforce over the years for your significant contribution to this American accomplishment. You’ve helped make the world a better place and should take pride in that. Today belongs not just to the 360 men and women who have flown on the shuttle, but to all of you who have helped their missions to succeed. Your work means a great deal to me personally. Those of us who have flown the shuttle put our lives in your hands each time we flew, and I never doubted that all of you on the ground, in launch and mission control, in orbiter processing, in every phase of the program, were absolutely dedicated, and among the most skilled and committed people I have ever known. The shuttle has provided this nation with many firsts, with many proud moments, and it has helped the United States to lead the world in space exploration. Over three decades, this flagship program has become part of the fabric of our nation’s history. It’s helped us improve communications on Earth and to understand our home planet better. It’s set scientific satellites like Magellan and Ulysses speeding on their missions into the solar system and launched Hubble and Chandra to explore the universe. The shuttle program has given us tremendous knowledge about a reusable spacecraft and launch system from which future commercial systems will benefit. It’s enabled construction of the International Space Station, our foothold for human exploration, which is leading to breakthroughs in human health and microgravity research. And it’s provided “first ever” astronaut flight and command opportunities for women and minorities. We’ll never forget the crews of Challenger and Columbia. Many of us counted them as our personal friends, and their achievements will live on in the spirit of perseverance and grit and hope in which they lived and worked. They were all true heroes who made the ultimate sacrifice in service to this country. The human spaceflight program will continue with astronauts living and working on the International Space Station for at least 10 more years. We wouldn’t have been able to build that orbiting outpost without the shuttle. We wouldn’t have established that model of global cooperation that serves as a guidepost for how we can work together toward the greater things of which we are capable as human beings. With the last flight of Atlantis in June, the shuttles stop flying, but they don’t stop inspiring, and they don’t stop being part of the fabric of America. Three museums and one NASA Center will have a shuttle orbiter to continue to tell the story of human spaceflight and American accomplishment. There were many worthy institutions who requested an orbiter and far too few to go around. But millions of Americans and people from around the world will continue to learn from these amazing vehicles and the stories of their crews and their missions in their new homes. The shuttle’s retirement is bittersweet for us, but I am also very excited about our future. 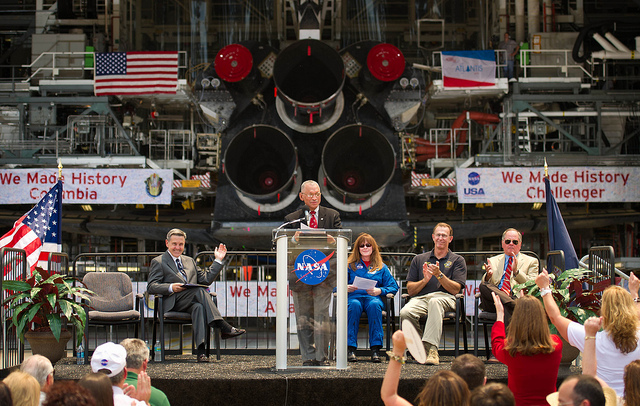 A future that is bright and open to us because of the shuttle program. We could not be reaching for new heights and developing the next generation of capabilities without the technological breakthroughs of the shuttle and the many lessons learned that we will carry forward. Our commitment to human spaceflight is steadfast, and with this amazing workforce, we will continue to lead the world in human space exploration and discovery.